The Reggio Calabria Club sits in a slight depression beside the buzzing freeway. It is West Brunswick in Melbourne’s north. On this Sunday afternoon in early May, the car park is full and the shiny main entrance beckons patrons through to the restaurant. Most are passing by , instead entering a plain side entrance and descending the tight, concrete staircase to the basement where they are greeted by two smiling women sitting behind a laminex table with cash box. A large Roman mural adorns the wall above. A boxing ring stands in the middle of an open floor and a card of three round male amateur bouts is underway. Toilets are doubling as makeshift change rooms and gyms from the working class suburbs of Thomastown, Airport West and Preston, as well as the recently gentrified St. Kilda, are represented. The fights are scrappy, honest affairs and points are displayed on small screens at the conclusion of each round. Small trophies are presented to the victors. An enthusiastic and typical boxing crowd occupies ringside tables while others lean against the walls. Hoodies, tracksuits and tattoos are standard. The corner bar sells cans of beer and coffee in foam cups, while pizza and pasta prepared in ‘Mum’s Kitchen’, is served on plastic plates. Former world champion, Barry Michael, works the crowd, handing out flyers for the next professional fight night he is handling. He pauses for handshakes and photos, his gold chain glistening under bright flourescent lights. With the amateur bouts over, the referees and judges wipe the sweat from their brow and dig into complementary pizza and soft drink. They are replaced by blazer wearing professionals and the ring announcer, who has been on the job all day, introduces the first female professional fight. He rushes through his own version of the national anthem. A shuddering right hook ends the bout in 69 seconds. Some of the crowd have drifted into the bleak early evening, however, most have stayed for the main event. Melbourne’s Susie Q Ramadan is about to enter the ring. Ramadan, International Boxing Federation World Bantamweight Champion, is scheduled to fight Queensland’s Sarah George in a ten round non-title fight. With a 20 victories, 8KOs, 0 defeats, 0 draws record, this is Ramadan’s first fight since claiming the world title in February. George has been defeated in two of her three professional fights, yet carries an imposing reputation from her days in the elbows and knees Muay Thai boxing circuit. Recently turned thirty-two years old, Ramadan is eight years her opponent’s senior. Ramadan has enjoyed her usual pre-fight routine. Her long dark hair has been braided and she has spent the early part of the day watching tapes of legends such as Floyd Mayweather Junior and Manny Pacquiao over servings of fish and chips. Her eight week preparation has gone well. She is ready. George is the first boxer introduced. Slender and athletic, blond hair tied back in a tight tail, weighing 49kgs, she could be a ballet dancer. She enters the ring quietly, accompanied by one trainer. The ring announcer allows the tension to build before introducing Ramadan. A smiling, high-fiving champion emerges under a hooded robe. A rap song penned in her name thumps through the basement. As usual, Ramadan is accompanied by long-term trainer, Ben Brizzi and her sister, Julia. Ben’s son, Sam, proudly carries the world title belt aloft. Ramadan enters the ring to cheers and camera flashes. While shorter than George, she has weighed in at 53kg. Both boxers are cautious through the opening round. George moves lightly and easily, hands low, head jutting dangerously forward. Ramadan is more technically correct, a boxer not a fighter. She is urgent, busy. Ramadan settles during round two with left and right combinations. George’s face reddens, yet she hardly flinches. The Queenslander attacks in the third. Ramadan evades. She is patient, waiting for an opening. It comes when George slips. Ramadan pounces. Over the next three rounds, Ramadan lands right hooks and upper cuts. George is hurt, yet still advances. She is far from intimidated by the world champion. Rounds seven and eight feature frenzied exchanges. Both fighters land punches. Ramadan has the better of it. George stings Ramadan in the nineth. The champion replies with right and left combinations. By the final round, George knows only a knock-out will bring victory. Ramadan could retreat and protect her points lead, however her competitive instincts won’t allow this and she stands toe to toe with George. The boxers deliver a stunning finish and at the final bell, they embrace to a rousing reception. This has been a brilliant fight and the most challenging of Ramadan’s career. Ramadan is awarded a unanimous points decision. During the presentations, she thanks her opponent, corner and family. Ben Brizzi says this has been a perfect preparation for a possible title defence in August. As usual, Ramadan’s father is ringside and reaches over for a congratulatory hug, while sister Julia carries out her post-fight ritual by phoning their mother who never attends bouts because she can’t bear to see her daughter box. Julia reassures both athletes are unscathed. Ramadan drapes her world title belt across her shoulders and poses for photos. She is smiling and reflective. She feels safe in this environment, with these people. 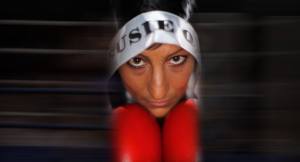 Susie Q Ramadan is at home in the boxing ring. Ramadan has not always felt this sense of wellbeing and sanctuary. Much of her pre-boxing life was spent searching for her path, her place. It has been a difficult journey. Her life is a boxing story. Born Sunduz (meaning Angel in Arabic) on April 10, 1979 to an Albanian father and Turkish mother, Ramadan spent her early years in the multicultural swirl of the Yarraville flats in Melbourne’s west. With both parents working long hours – her father was a reblocker of houses, while her mother worked two cleaning jobs – Ramadan, known as Susie from an early age, and sister Julia, one year older, spent much of their earlier years fending for themselves. Trouble was not difficult to find and Ramadan admits she often ran with the wrong crowd. The Ramadan sisters attended a now closed Footscray secondary school where ethnic gangs ruled the corridors. Drug abuse and violence were commonplace. Being of the Islamic faith meant the Ramadan sisters were often targeted. They learned to look out for each other. Susie’s short stature also made her a favourite for bullies. Pushed to breaking point one day, she retaliated physically against her larger antagonist. Having proven she would not be intimidated, the bullying stopped at that point. Despite the problems, Ramadan enjoyed school and held ambitions of a career in forensic science. Her analytical mind enjoyed problem solving and working with formulas. However, her studies eventually lapsed and halfway through Year 12, she left school. Ramadan’s problem solving brain would be perfectly suited to her later career choice. Once released from the routine of school, Ramadan began searching for her place in the world. Employed from an early age in cafes and restaurants, she tried many different career paths, including security and night-shift factory work. Her most intriguing job was as a private investigator where she often trailed and spied on suspected welfare cheats. The pressure and unsocial hours connected with this role made life difficult and it eventually went by the wayside. In a sporting sense, Ramadan tried everything. Her first loves were dancing and soccer. The same aggressive competitive streak that saw off school bullies drove her to star at the world game and she rose through the ranks to the verge of Matilda squad selection before suffering a career ending knee injury in a club game. Ramadan believes she was deliberately injured in a crude opposition tackle. Ramadan’s active mind and high energy levels still required sating and once her injury had healed, she turned to boxing, attracted by its demands on discipline, fitness and tactics. The ancient sport of pugilism was not a huge stretch for Ramadan as she had earlier tried kick-boxing. Ramadan started training in a boxing gym in a Coburg industrial estate and before long was hooked. In 2006, on advice from a friend in the boxing game, she headed across to the Brizzi Brothers Boxing Gym in Kingsbury in the north eastern suburbs. There she met Ben Brizzi the man who would eventually guide her to world championship success. The son of Italian immigrants, Ben Brizzi has boxing in his blood. A feature on TV Ringside at Festival Hall during the mid-’60s, Brizzi fought fifteen pro-fights before an eye injury ended his career. Shortly after, his father opened a makeshift boxing gym in the family garage in Preston. Ben and brother Cos, worked in the family cartage contracting business during the day and trained themselves and others during their spare time. This tin shed gym kept many local youths off the streets and out of trouble. In 1989, Ben and Cos moved the gym to its current location in a small, square bricked building at the Kingsbury Youth Club and Tennis Club which can be found turning left at the tyre factory opposite the cemetery on busy Plenty Road. Inside, a large square of canvas is stretched across dusty floorboards and bordered by loose ropes. This serves as the ring. One wall is full of mirrors. A Plumbers Union flag, posters and photographs of legends like Ali, Rose, Ellis and Fenech, as well as a framed photograph of the Brizzis with Famechon, adorn the other walls. A heavy bag hangs from a tree outside. Three Australian champions have been prepared by the Brizzi brothers. Most who train on a daily basis are amateurs, tradesmen in blue singlets and khaki shorts with dirt on their knees and elbows and cuts above puffy eyes. Susie Ramadan was the first female to enter the Brizzi gym. When he first set eyes on the sharp, dark features and diminutive build of Ramadan, Ben Brizzi didn’t know what to make of her. Ramadan said she wanted to box, not just train. Brizzi said she could train: punch a bag, skip rope, improve her fitness. But box? No way. He wouldn’t be responsible for her entering the ring against larger, stronger opponents with the potential of serious injury. Ramadan was determined to convince Brizzi to take her seriously. She believed her search was over and the boxing ring would become home. She persisted, training for longer and with more intensity every day. Extra training sessions were organised between shifts as a gym instructor, a job Ramadan still holds due to the lack of money in female boxing. Eventually, she improved to the extent Brizzi could no longer assign her to a bag in the corner. In particular, Ramadan’s willingness to learn, her anticipation, footwork and counterpunching impressed Brizzi and others at the gym. He also acknowledged something deep within Ramadan: single-minded self belief. One journey had ended and another was to begin. Within twelve months of entering the Brizzi gym, Ramadan stopped her first amateur bout inside two rounds. Two more amateur fights followed, including a controversial points defeat after her opponent was rewarded for a punch that didn’t connect. Thus far, this has been the only defeat of Ramadan’s career. Fearing their reaction, Ramadan did not tell her parents of her new passion until after the first amateur fight. Once the shock subsided and they recognised their youngest daughter’s conviction, they threw their full support behind her. Eventually, the family would move to the suburb of Reservoir to be closer to Susie’s training. Sadly, the same can’t be said for all in Melbourne’s Islamic community as some believe a boxing career inappropriate for a female Muslim. Also, a number of so-called friends have dropped off, unable to cope with Ramadan’s rise. Just as displeasing has been the materialization of insincere hangers-on, attracted only by success. Undeterred by criticism and defeat, Ramadan turned professional and accounted for Thai boxer , Ploysuay Sakrungruang, in Ferntree Gully, towards the end of 2007. By defeating Edith Smith in her fourth bout, she became the Australian Super Bantamweight Champion. Somewhere along the line Ramadan acquired the moniker ‘Susie Q’, named after former heavyweight champion Rocky Marciano’s favourite punch. The Oriental Pacific Boxing Federation Women’s Super Bantamweight, the World Boxing Foundation Women’s Super Bantamweight, and the World Boxing Foundation Women’s Bantamweight titles followed. As impressive as these achievements sound, they are considered minor in the world of boxing. Ramadan craved a major title. The opportunity came on February 20 this year when Ramadan fought American Terri Lynn Cruz (17wins, 8KOs, 7 losses, 2 draws) for the vacant International Boxing Federation bantamweight title. As usual, preparation was meticulous. Brizzi and Ramadan’s relationship is close and intuitive and the veteran trainer knew how hard to push his charge in the gym. Tactics discussed included Ramadan using her quick footwork during the early rounds to move the heavier Cruz around in order to sap her energy levels. Once achieved, heavy punches designed to hurt would follow. The Reggio Calabria Club was again the location. Ramadan endured her pre-fight routine with more nerves than usual. The weight of expectation was greater and this was the day she had dreamed of since first entering the Brizzi gym. Once the fight started, anxiety and nerves dissipated and she found her focus and target. Ramadan’s footwork and technique frustrated Cruz and she was able to land her trademark uppercut. Ahead on points, this was one occasion she did evade her desperate opponent in the final round. All three judges awarded Ramadan a comfortable victory. Susie Q was world champion. (Ramadan is not Australia’s only female world champion. W.A’s Erin McGowan holds the less recognised WBO Lightweight title). A World title has assured Ramadan’s place in Australian boxing history. The riches piled at the feet of male world champions have not yet come her way. For that to happen Ramadan will have to venture overseas and fight on the undercard of a legend like Pacquiao. Unification of the IBF, WBC and WBA bantamweight titles would bring immortality. As she prepares for her first title defence, Susie Q Ramadan knows that whatever the future brings, she will continue to live her life her way. Boxing has brought her home. Hers is a boxing story. Andrew – marvelous work. Obviously a lot of blood, sweat and tears went into this. I’ve always been attracted to boxing, but only at the highest level. I think a boxer with timing, strength, speed, and ring craft is a beautiful sight. Unfortunately too many fights these days are boring slugfests by unskilled athletes. Women’s boxing has always made me feel uncomfortable. I haven’t watched much of it but what I have watched has disturbed me a little. Watching women box is a bit like watching a young kid smoke – its not strictly illegal but just looks wrong. Perhaps the problem lies with me and not them. It’s worth reading because it gives a pretty good insight into why a woman might want to box. Dips, I agree, there is something disturbing about women’s boxing. That’s what intrigued me about Susie. However, watching her box and train is pretty inspiring. I recall being surprised by her skill, aggression and fitness. I shouldn’t be, she’s a world class athlete. Her bout against Sarah George at the Calabria Club was sensational. They made the amateur males on the card look pretty ordinary. IS – thanks I’ll check this out. Intriguing subject in a broad sense as well. For example, why on earth would women be campaigning to get on the front line of a war? Crazy stuff. Andrew – as I said maybe the problem is with me. Maybe I just need to get my mind around it. The world is changing and I’m getting left behind! However I doubt two female boxers could ever come up with a bout like Sugar Ray Robinson and Roberto Duran. Hi AS, great story. You have captured, as you state, the boxer’s story. I like how you knit Suzie Q’s personal search into the arc of boxing’s popularity as a sport. I don’t particularly have a problem with females boxing but I do not like boxing at all. Like many others, I have shifted my opinion. My moment of truth was way back in 1990 at the Belmont Hotel in Perth. I went with the old man, very interested to see the sport up close and personal. After the fourth or fifth bout I had had enough. The blood, the sound of someone’s face being struck, the voracious hunger of the crowd, it was all too much. I couldn’t see the sport for the lies. That’s boxing, it polarises opinions. I love it for what it requires of the boxer. And for the stories behind the people. Real blood, sweat and tears boxing people are great.